Georgetown repents for its history of slavery. Will we? On Sept. 1, John J. DeGioia, the president of Georgetown University, announced that the school would formally ask for forgiveness and seek to make restitution for the institution’s involvement in the sin of slavery. By doing so the Georgetown community engaged in a process in which all Catholics are called to participate, one that the church has used to dramatic effect as it sought to redress wrongs in its own history. The journey of reconciliation is usually told from the point of view of the individual sinner. But sometimes institutions and, even nations, must set out on the path of repentance. No sin is more worthy of attention and prayer than this country’s original sin of slavery. Georgetown is seeking to address a morally shocking episode at the center of its history. In 1838, the head of the Maryland Province of the Society of Jesus, Thomas F. Mulledy, S.J., decided to sell 272 slaves to help provide financial support to Georgetown University. He did so against the explicit orders of his superiors in Rome. The history of this sale—and the Jesuits’ larger involvement in the slave trade in the United States—was widely known within Jesuit circles and has been the subject of extensive scholarship at Georgetown and elsewhere. The episode drew renewed scrutiny last year as students protested the fact that two university buildings carried the names of individuals at the center of the scandal: Father Mulledy and William McSherry, S.J., both of whom also served as presidents of the university. A working group made up of Jesuits, students and faculty was assigned to study the issue. 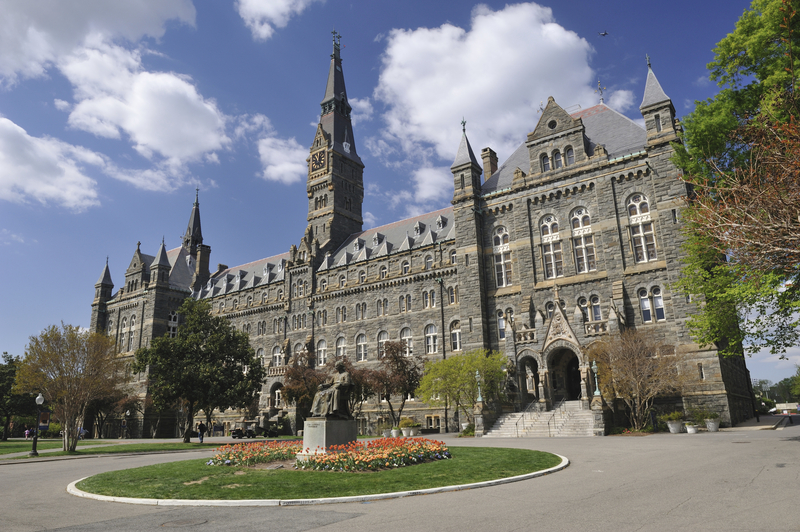 In addition to celebrating a Mass of forgiveness and reconciliation, Georgetown will rename the two buildings in question: one in honor of Isaac Hawkins, the first slave listed among those who were sold, and another for Anne Marie Becraft, an African-American woman religious who opened a school for black girls in Washington, D.C. Meanwhile, descendants of the slaves who were sold who apply to Georgetown will receive the same treatment as legacy applicants. These steps may be thought of as Georgetown’s penance or perhaps, in secular terms, as reparations. But before receiving absolution, sinners must give an account of their sins. In a penitential service in St. Peter’s Basilica presided over by St. John Paul II in 2000 to address the church’s historical sins, the rite began with a listing of wrongs that had been committed in the church’s name. For Georgetown, the journey to reconciliation began when it unveiled the Jesuit Plantation Project several years ago, now called the Georgetown Slavery Archive. These records shine a clear light on the facts. Though Father Mulledy attached specific instructions to the sale of the slaves—families were not to be separated, for example, and were to be allowed to practice their Catholic faith—these instructions were ignored. The slaves were clearly sold to help finance the university. Evidence of institutional complicity in the U.S. slave trade is rarely so cut and dried. Other institutions that seek to account for their own participation in the slave trade may find it more difficult to render historical judgments. A few other lessons can be learned from Georgetown’s journey. First, sometimes institutions, like individuals, must be called to repentance. At Georgetown, the Working Group on Slavery, Memory and Reconciliation was formed after student journalists reported on the university’s history and the campaign to rename the two buildings gained steam after protests roiled the campus. The Working Group is to be strongly commended for undertaking a rigorous process of examination, but the process might not have proceeded as rapidly without the efforts of these young journalists and student protesters. Second, the process was aided by the diversity of the commission, lay and Jesuit, students and faculty. Perhaps a descendant of one of the slaves who were sold should have been included, but Mr. DeGioia pledges that these individuals will be consulted as the university implements the Working Group’s recommendations. (These voices might argue for more financial support for slave descendants applying to Georgetown.) Third, actual penance is important. The work of reparation is one of the ways Christians cooperate with grace. Finally, the sin of slavery still haunts us. Few American institutions, whether Georgetown or an Ivy League university, the church or the U.S. government, can declare themselves untainted by the sin of racism or claim that slavery is a painful historical episode but no more than that. Reflecting on the discussions at Georgetown, the Maryland Province of the Jesuits recommitted itself to examine “our own generation’s” moral blind spots. Surely this is one of them: A century and a half after the Civil War, the legacy of racism still surrounds us, visible in the poverty of our cities, the inequality of the criminal justice system, the segregation of schools and suburbs and the avoidable deaths of too many black men, women and children. As our nation sets out to atone for the sins of the past, how will we account for the signs of sin we encounter today? CORRECTION, Sept. 29: This editorial initially misstated the sequence of events related to the formation of the Working Group on Slavery, Memory and Reconciliation. The Working Group was formed in September 2015 and student protests followed later that fall. These protests did not predate the formation of the working group. It's not the horrible fact of the years of slavery, But most important what has happened since. A visiting Jesuit priest during Christmas time in a small northwest community brought up the issue if Bigotry, Prejudice and Bias's after a incident involving the police and a black student. People were so upset with the priest that they turned away at the Eucharist. And a lot of the Male attendees turned their backs on the priest and walked out of the church. The Bishop then said to cool down, don't bring up this issue again, the priest was recalled back to the university. Over the next year we approached the community on the subject and in time there began to be an awareness of long ingrained attitudes that people wouldn't of wanted others to treat them or their children. This was in the 70's and 80's. We at the church and school put emphasis on Gettysburg Address by Lincoln and other historical actions to focus on how our social world had become so narrow in our views of different peoples within our own community and ourselves. We especially started by examining our own religious and education views. It takes time and constant awareness over and over again. We published a small reader to examin our own persons and then in groups that would challenge us to become aware and act on our own ills and then work hard on altering our mind set and behavior. The first element is to be honest with oneself and take actions to deal with oneself. We created tools and it worked in small groups and in the community, but even today it takes daily action to overcome 500 years of inborn and ingrained ills. The more I think of this process, the more I think it is a self-congratulatory political exercise. How exactly is apologizing for other peoples' sins a form of repentance? How does one compensate those hurt by slavery who are now long gone - by offering legacy admissions to those who are 1/32nd-related to one of these injured black slaves. Why not abolish all legacy favoritism, since it discriminates against the unrelated? Isn't this apology-for-others really puffing oneself up by putting other people down? And, how exactly is, say a new European immigrant, guilty of past sins of racism just because they are white? Doesn't that just perpetuate racism. Luke 18:11 comes to mind "God, I thank you that I am not like other people: thieves, adulterers, or even like this [insert historical sinner here]"
This article also appeared in print, under the headline "Georgetown Repents," in the September 26, 2016 issue.